IKEA is my happy place. 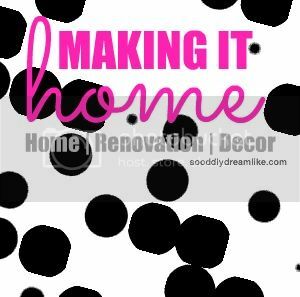 In the past because it gives me the most realistic setting ever to dream about how I’m going to set up our home and now, it’s where I source for products to make all those dreams come true. In fact, my dream job is to be part of the team at IKEA that gets to redecorate the place over and over again. In a way, I’m fulfilling that dream, because I’m going to be collaborating with IKEA for the next 4 months to come up with things, I haven’t even imagined as of now. It can be hard to imagine how an aspiring minimalist like me can work with IKEA, and bring more things into our home. I had that worry as well, but I am now at peace because I’ve figured out a way for it to work without me compromising on my beliefs or choice of lifestyle. Its also a testament of my faith in IKEA products. This month, my task was to prep our home for guests. I have family and friends to invite over to my new home and this task was perfect for me. However, I had made up my mind not to pretend, so there won’t be anything in this post that I wouldn’t do myself without the IKEA engagement or anything so difficult, you wouldn’t do it either. Every single product I used in this post can be used in multiple ways, so you need less in the home to do more. I pick clear glass serve ware as the permanent (and only) serve ware I will be using at home from now on. The occasion can change throughout the years but, precisely because you can see through clear glass ware, you can use the same glass serve ware and still dramatically change how the table setting looks. All you need is to get creative with what you choose to show through the plate’s bottom! 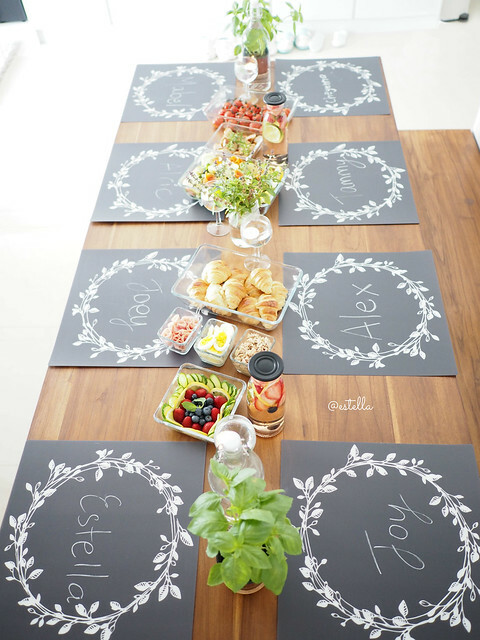 For our breakfast brunch, I decided to use place mats as chalk boards to create interaction and show my guests where they should sit! These are the IKEA ÖPPEN clear glass plates. I have been using them for months, even before working with IKEA. They spark joy for me, because they have a pretty, slight curve at the sides that keeps food in and look very minimalist. They’re stable but light, so they’re easy to handle when washing. For our breakfast brunch party, I picked the IKEA VINTER 2016 collection place mat in grey. It’s meant for the Christmas season but I like how it isn’t in your face christmassy and I can use it for occasions other than Christmas. 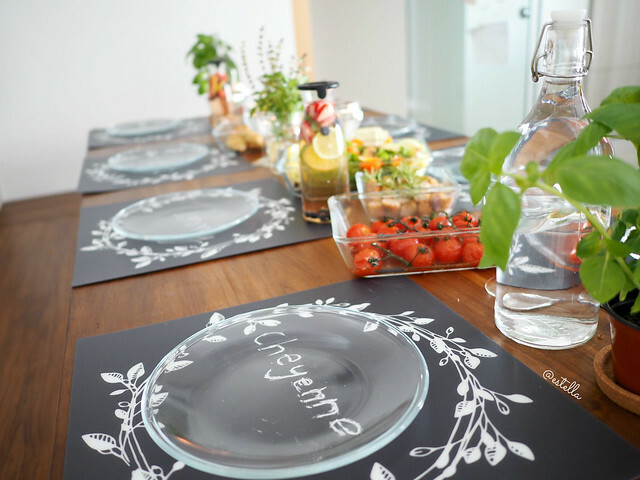 The IKEA VINTER 2016 collection placemat reminds me of a chalk board and I decided to use it like that to have our guests’ names written on it with a white IKEA MÅLA Chalk – no need for placecards. 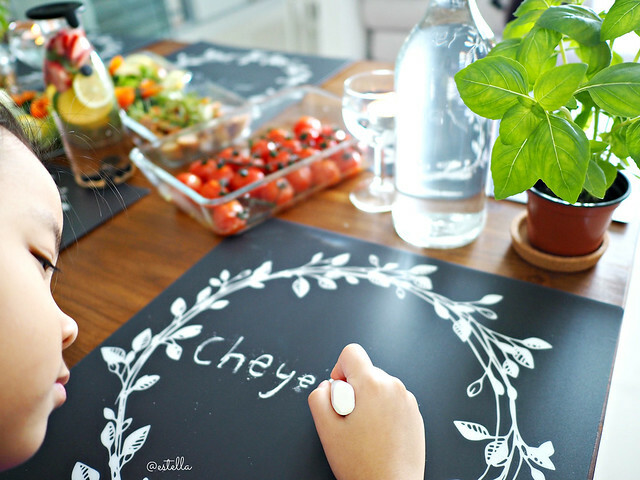 You can write on the mats with your best handwriting or invite guests to participate and write their own name. I choose to use only bamboo chopping boards at home because they are more sustainable, hygienic and easy to clean. Other than it being made of bamboo, the IKEA RIMFORSA Chopping board was my choice because it is designed with a trench that catches liquids and things like seeds from the food I am cutting and it’s designed to be hang up on a rail – something I need because my backsplash is made of glass (no drilling) and my kitchen Eubiq system comes with a rail that is perfect for hanging it up to dry (more hygenic than leaving it on the counter). 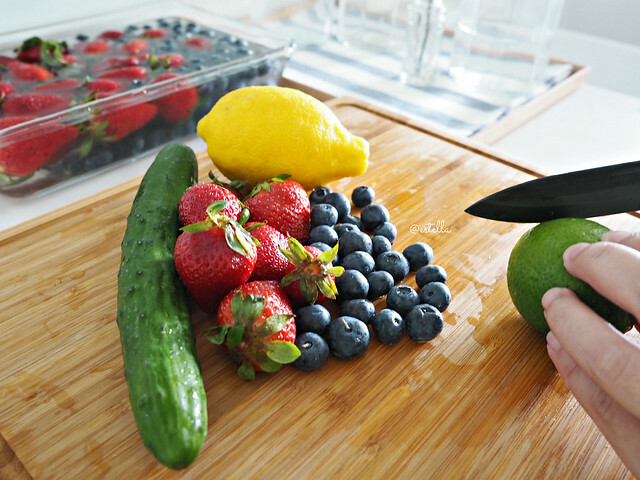 Some of my friends use the RIMFORSA Chopping Board as a serving board, because it is elevated when placed flat, just take care not to use it as a chopping board if you use it as serve ware. 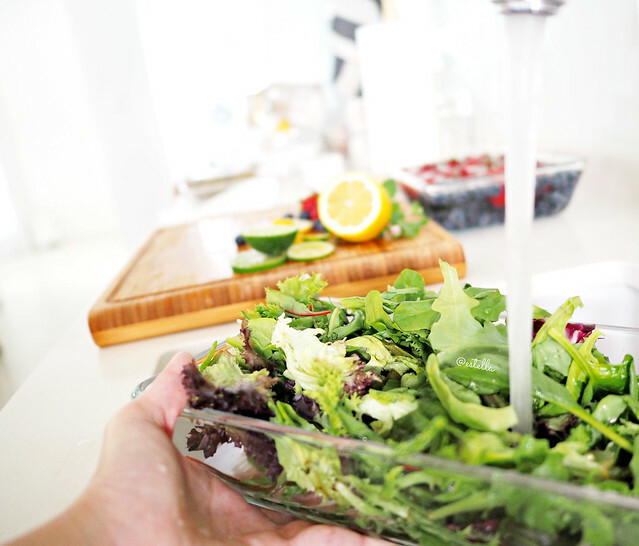 We wash and soak fruits, salad greens in a vinegar and water mixture to clean them and I use the very same serve ware we’ll be serving them in to do that. You have to take care to clean well but that saves you the need to use other serve ware – less to clean, less resources used to clean another dish. To make my serve ware work even harder, I picked serve ware that are oven safe. 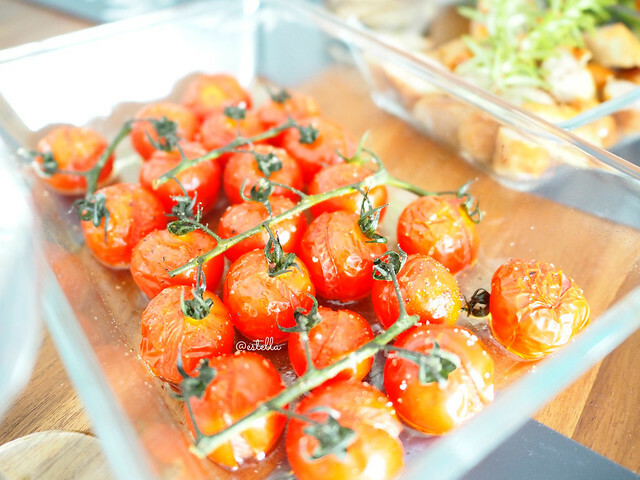 The IKEA MIXTUR Oven / Serving Dish in Clear Glass can go from oven to table and still look good. Since clear glassware automatically go well with each other they blend seamlessly with my plates, and the rest of the table setting. I avoid buying things that are for decoration only but that doesn’t mean that my table setting has to be plain looking. Nature doesn’t need to buy decoration, so I use nature in terms of herbs I am already growing at home. One of the things I did was to go to my balcony and cut a few sprigs of my flowering basil from IKEA and randomly put them in a recycled glass jar. 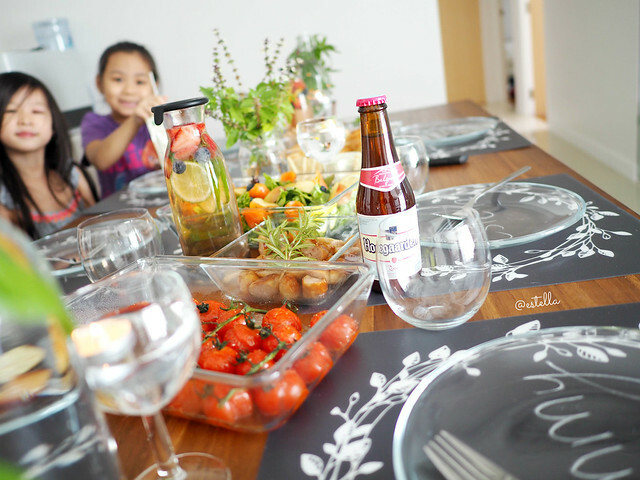 They not only make my table setting look rustic but also elevate our dining experience in very subtle ways. Herbs smell good and have different beneficial properties. Rosemary and Basil are natural insect repellants, Mint sedates and disinfects, Lavender calms and are disinfectants too. In case you’re wondering, my cut basil springs won’t die just because I cut them off from the mother plant. In actual fact, I’m propagating my basil plant. In a few days, roots will grow on the lower stem part immersed in water and I have more basil to go around. The basil pots (see picture below) I used as part of the table setting are also gifts for my guests. After our party, my guests took them home. The best part of incorporating herbs and the food itself as decoration is that you don’t feel there is a lot of un-decorating work to deal with when the party is over. Just do the dishes baby. 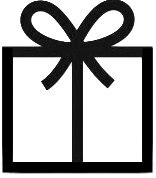 Herbs are also gifts that keeps on giving, my guests can use the herbs in daily cooking or propagate them to giveaway as gifts in turn. One of the ways to create an interesting table centerpiece is to make sure to include items of different heights for contrast and variation. I used the guests’ basil pots, my basil and our drinking receptacles to create different heights. 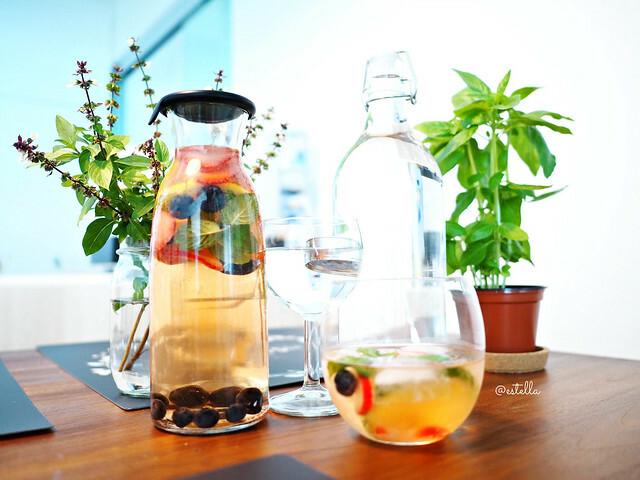 The IKEA KORKEN Bottle with stopper (1L) holds plain water for hydration and the IKEA VARDAGEN Carafe with lid (0.5L) contains fruit & herb infused water for taste. I normally use the IKEA FÖRSIKTIGT Wine glass to make a more formal table inclusive for children (they get to drink from and toast with a real wine glass!) 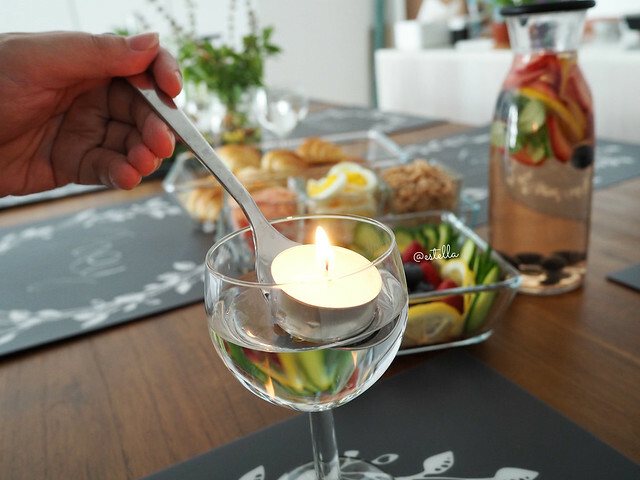 but for our brunch party, it was used as a candle holder, to hold the IKEA SINNLIG scented tealight in Vanilla pleasure. My drinking glass is from somewhere else, but the IKEA IVRIG Glass is very close to it, and more affordable. Our food table is also coloured using our food itself. Eating colorful, fresh food not only means we get good nutrition. When Joy came out of her playroom to the food table, she said “Wow! We’re having super delicious food!”, in fact, the children were the first to be seated at the table! The sight of the colours from food whets your appetite and adds to the dining experience. I used a combination of the different bakeware from the IKEA MIXTUR collection, namely, the MIXTUR Oven/serving dish (15x15cm), MIXTUR Oven/serving dish (27×18 cm) and MIXTUR Oven/serving dish (set of 4) to serve our food so that their colors can be seen from every angle. If you check 2 photos up, the long serving dish from the set of 4 is absolutely perfect for cheese and crackers. How much thought you put into a dining experience is in the details, and I mean the cutlery you use. Personally, I notice the weight and shape of my cutlery. A slightly heavier set of cutlery gives me the feels and a simplistic, rounded design makes the table classier in a subtle way. I did extensive research when looking for cutlery for our home and I picked the IKEA FÖRNUFT 24-piece cutlery set. They have a very good weight (doesn’t feel cheap at all) and a beautiful shape. The knife from this set is also my butter knife. The best thing about this set is that it is very, very affordable. A few people on the internet loves the FÖRNUFT 24-piece cutlery set as well, you can google to read what they like about it. Also, in case you want to know, the spoon from this cutlery set is perfect for easing a tea light into a wine glass. The IKEA MIXTUR collection can fit into one another easily in the sink and in my cupboards. 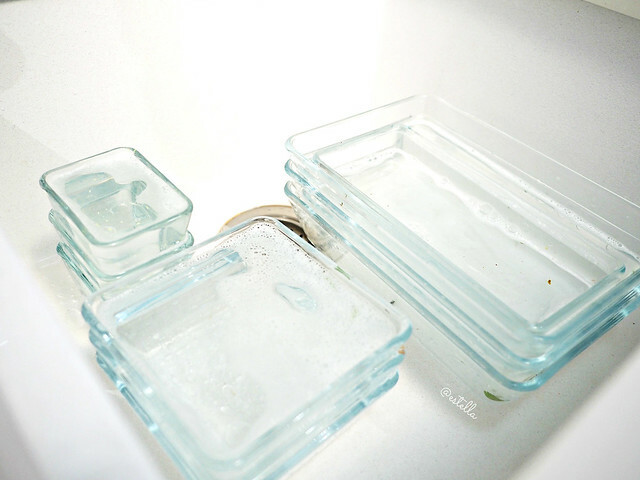 In the sink, the sight of a loaded sink of clear glass ware is very much easier on your eyes than other serve ware, and physiologically, I feel that the washing load is a lot lesser with a neater sink. In my cupboards, the IKEA MIXTUR collection takes up far less space than other serving dish sets of different size and, I’m also saving on the cost and storage space of baking tins. That’s why, they’re truly my favourites, out of everything in this post. 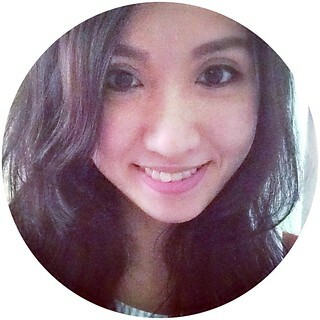 Disclosure: This post is part of a series of posts from my collaboration with IKEA Singapore. All products used in this post as indicated are sponsored by IKEA but all ideas, creativity and experiences are my own (and my friends’). Special thanks: Big and special thanks to my friends, Tammy, Mabel, Joey and their children for helping me with the food preparation and brainstorming with me for this post. They’re the same people behind this Halloween Party and I’m looking forward to more gatherings at my place. Let’s do Christmas! 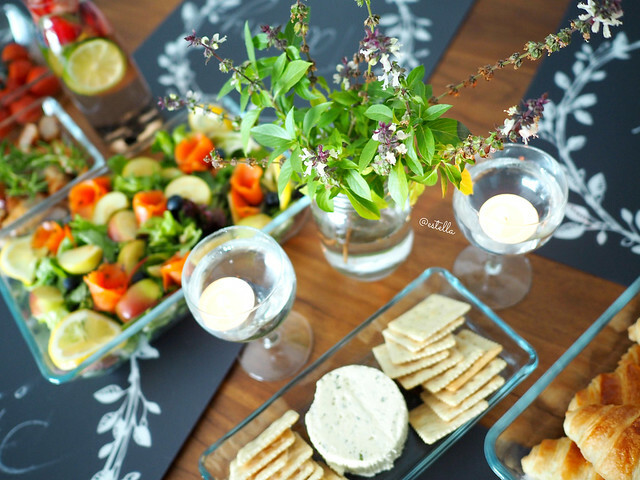 The glass plate over the placemat is such a clever idea for hosting guests and I like that it looks so classy and put together. I must go check them out at IKEA soon. Yes, the two of them go so well together, its like a dream! Have fun! Love the chalk idea! I’m sure everybody will be stealing this idea from you from here on!